We have already reviewed Lorex before. They offer completely wireless surveillance cameras. 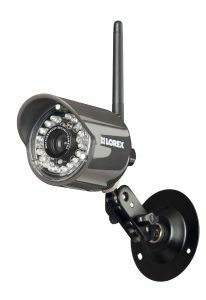 This one, the Lorex LW2110 Ultra Digital uses an wireless interference-free micro receiver to send the signal to your DVR or security monitor. If you want a camera that has minimal installation set up, or for situations where you can’t or aren’t permitted to drill cables through or around walls this is ideal. This setup is ideal if you are testing camera locations, or have moved to a temporary location, and drilling or cabling is either too much hassle or unfeasible. The LW2110 is also weather proof (IP66 rated) and will operate it temperatures ranging from -10 to 50 degrees Celsius. It also has built in LED’s which will allow you to see up to 60ft from the lens at night. The camera has an antennae which sends signals to the receiver and they can transmit over a range of about 450ft across open spaces, or 150ft inside a building. The antennae on the cameras will pivot up to 180 degrees which will allow you to mount the cameras under eaves without encroaching on the signal. The wireless transmission does not interfere with telephone or internet networks. It uses secure technology named Frequency Hopping Spread Spectrum (FHSS). This transmits on the 2.4GHz digital frequency band, so it does not come into conflict with other household frequencies. This also keeps your camera network secure and tamper free. Images are rendered crisp and vivid, the cameras also have an IR cut filter which enhances skin and natural color tones.The resolution is SD 640X480, it will be nice to see the HD version of this as image quality is not visibility reduced via the wireless transmission. If you are viewing on a small monitor the footage quality is very good. The wireless receiver is portable so you can carry it about and plug it into a portable television on any room in your home. It’s plug and play so for a cheap completely wireless security camera the overall value is appealing.